Unspecified by Bible text. I have set the scene in the late afternoon. The sun lights the scene from the right. The burning bush also provides a warm, yellow glow to the ground & figure. This scene follows on from the previous, in that I have used the same colours for the rocks. 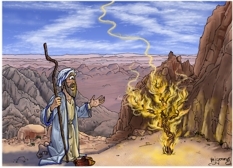 Moses has walked over to the burning bush & is now kneeling on the rock we could see in the mid ground of the previous scene. In that previous scene we could see a dark coloured rock face on the extreme right hand side of the picture. That dark rock face we can see behind the burning bush in this scene. Prayer is a response to God’s call. Moses placed himself at God’s disposal, as many other Biblical characters did in the Old Testament; see Samuel (1 Samuel 3:4) and Isaiah (Isaiah 6:8) and in the New Testament; see Ananias (Acts 9:10) and Paul (Acts 26:9). God is uniquely holy, and that word sets God apart from human beings. Objects and people are only said to become holy through their association with God Himself. 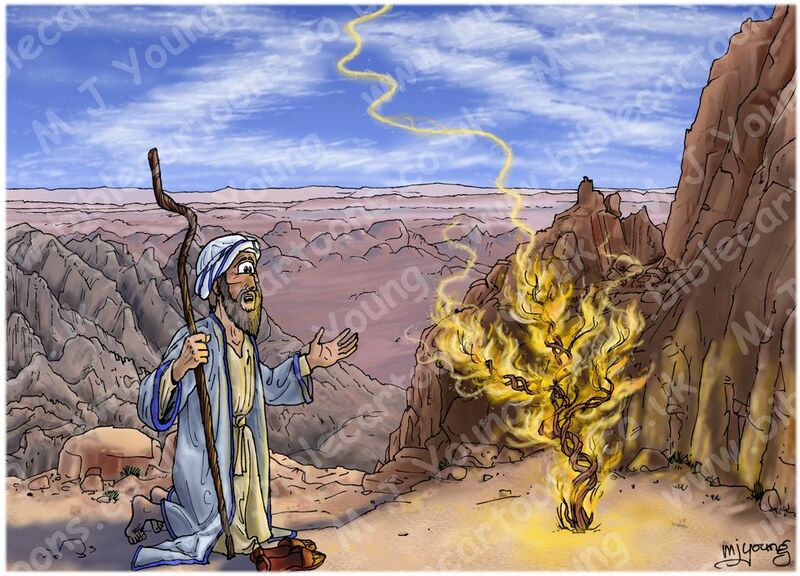 The ground on which Moses stood in the narrative was said to be holy because God was present there and speaking to him though the burning bush. Holiness makes us aware of our lowly status as created beings when compared to the Almighty God. Holiness tends to make us afraid, as Moses was in this encounter. Life after death, as an individual hope, is not clearly described in the Old Testament. The basis of such hope is found more fully described in the New Testament, as a product of a personal relationship with God, through Jesus the Christ. In Luke 20:37-38 Jesus (talking to the Sadducees and scribes, who only accepted the first 5 books of the Bible: the Torah) used this statement “I am the God of your father, the God of Abraham, the God of Isaac and the God of Jacob” to indicate that God is the God of the living, not the dead. Jesus taught that those who die in faith, therefore, continue a relationship with God beyond their death and the grave. As God’s revelation of the truth continued from Genesis onwards, the hope of individual existence beyond death became clearer, and the resurrection of the dead became established.